Fred Anderson is Professor of History at the University of Colorado, Boulder. I recently read with dismay an essay that Peter Wood, the president of the National Academy of Scholars, published on this site: “Why Conservatives Are Up in Arms at the College Board’s Advanced Placement Course in History.” Dr. Wood asserted that the College Board’s recent revisions in the AP U.S. History Curriculum framework reflect something like a conspiracy to impose a radical interpretation of American history on the thousands of high-school students who will take the AP course and examination in this and coming academic years. I write now as one of more than a dozen historians and teachers whom the College Board originally asked to review and suggest improvements to the course. While I’m sure that nothing I can say will dissuade Dr. Wood from the jaundiced view he and his fellow critics take of the new AP U.S. History course, I hope that HNN readers will benefit from having a first-hand account of what happened during the meetings of 2006-7 from which the new course framework emerged. 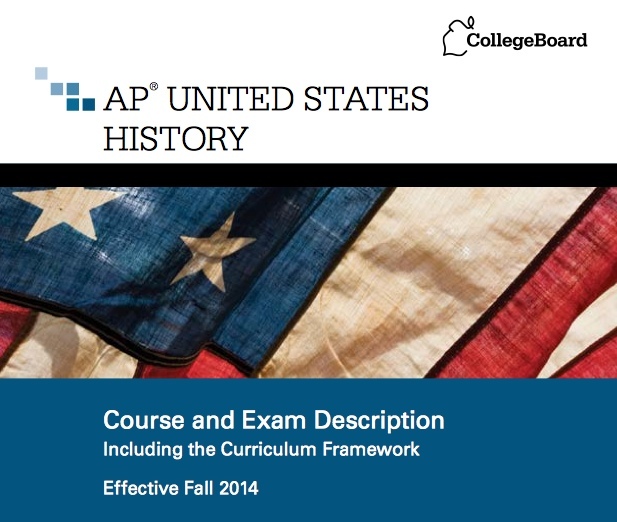 The College Board convened our working group, “the AP U.S. History Redesign Commission,” to advise it on what had become a matter of substantial concern: whether those high-school students who took Advanced Placement U.S. history courses really were receiving instruction equivalent to lower-division history survey courses offered in university and college settings. After considerable discussion we concluded that AP U.S. History was indeed in need of reconsideration if it was to reflect accurately current practices in the teaching of university history survey courses. Among other causes of concern, we found that the brief framework which then described the course, and in large measure governed its content, was sketchy and under-conceptualized. It consisted of a dozen suggested themes (each defined by at most a sentence or two), followed by a list of 136 topics grouped under 28 mostly-chronological headings that defined extremely broad periods before the Revolutionary era, and increasingly narrow ones thereafter. (I can’t refrain from observing, pace Wood and his fellow critics, that such significant historical figures as Benjamin Franklin, John Adams, and James Madison were hardly mentioned there.) This framework seemed both to invite a textbook-driven approach and to encourage teachers to use “test-prep” techniques that might enable students to game the AP Exam but which would do little to teach them to think historically. Two large areas of concern related to skills—it seemed to us that the current course organization offered too few opportunities to analyze primary sources and to practice critical thinking and writing—and to the balance of coverage. As a student of early America, for example, I was struck by the framework’s scanty treatment of pre-Columbian and colonial history, to which just 3 of the 28 chronological headings and 16 of the 136 topics were allocated. It seemed deeply troubling that the first half of the 500-year period that the course ostensibly covered was being marginalized, if not in practice neglected altogether. My fellow Commission members and I also believed that teachers of what was meant to be a college-level course should have the same freedom, and time, that college professors have in choosing their own approaches to individual periods and subject matter. We therefore recommended that the new framework, the outlines of which we sketched over a year’s worth of meetings, should continue the previous practice of not naming essential historical figures or detailing individual events, since we assumed that experienced history teachers would undoubtedly be familiar with those already. Instead we defined seven overarching themes that should become the organizational backbone of the course, which we argued should be organized into just nine broad chronological periods. We never intended to prescribe coverage beyond the conceptual level because we believed that individual teachers should be free to construct syllabi suited to their own teaching styles and preferences, and to their students’ needs. Advanced Placement courses have always been elective, aimed at earning college credit and placement for the students who take them. Colleges and universities must therefore be assured that the AP U.S. History course is in fact plausibly equivalent to their own faculties’ introductory American history survey courses. The Commission members did not feel that the changes we recommended would or should affect any state’s (much less any school district’s) support for Advanced Placement. Ultimately we were convinced that our charge was to promote a level of AP instruction, as measured by the annual exam, that would produce students well-grounded in factual knowledge and capable of the kind of analysis and synthesis that constitute mature historical thinking. Such is the intention, after all, of the college and university courses that the AP course is supposed to approximate. At least as I teach my own introductory course at the University of Colorado, the goal is to produce students who understand that historical knowledge—whether of the American past or any other—depends on two absolute rules: first, that historians cannot make anything up; second, that they cannot leave anything out merely because it strikes them as inconvenient, embarrassing, or out of keeping with preconceived notions or conventional wisdom. If I succeed in teaching that lesson, my students come away understanding that good history is that which offers both the most inclusive and the most coherent possible account of the past. To promote that kind of understanding was what the members of the Redesign Commission wanted most to achieve in revising AP U.S. History. Dr. Wood, who is not a historian, makes clear that his quarrel is not so much with the new framework or with the College Board as with the current state of American historical scholarship. Presumably he will identify me as a fellow traveler with a coterie of radical historians (including Howard Zinn, Gary Nash, and Thomas Bender) allegedly determined to portray “America as a nation founded on oppression, privilege, racism, and heedless exploitation of the environment.” But in my recollection, at least, the goals of the Commission were less ambitious than that. My fellow members and I wanted to make the AP U.S. history course a more rigorous reflection of the current state of knowledge and practice in our discipline. We hoped that future AP students would emerge from the course not just with a fund of facts at their disposal, but knowing how to ask productive questions about the past, and understanding why historical arguments must be governed, always and only, by the evidence. Dr. Wood’s tortured reading of the Framework and his blanket denunciation of academic historians suggests that he, too, might pause to reflect on the values of rigor, impartiality, thoroughness, and intellectual honesty that were, in the end, all we hoped to foster.